By reflecting art, beauty and space, this minimalist garden inspires peace and harmony in one's life. It is used to meditate, regenerate and connect to the deeper meaning of life. Sand in the garden symbolises purity, and represents water. Ripples created by raking the sand represent flowing water or waves. And other patterns hold different meanings Raking and re-raking the sand to new patterns is meditative. Rocks symbolise mountains, rock formations, islands, trees or animals. The placement of rocks or crystals creates and intended meaning for the "gardener." Made on a beautiful cotton cloth, it is easy to transport with a hand printed design. 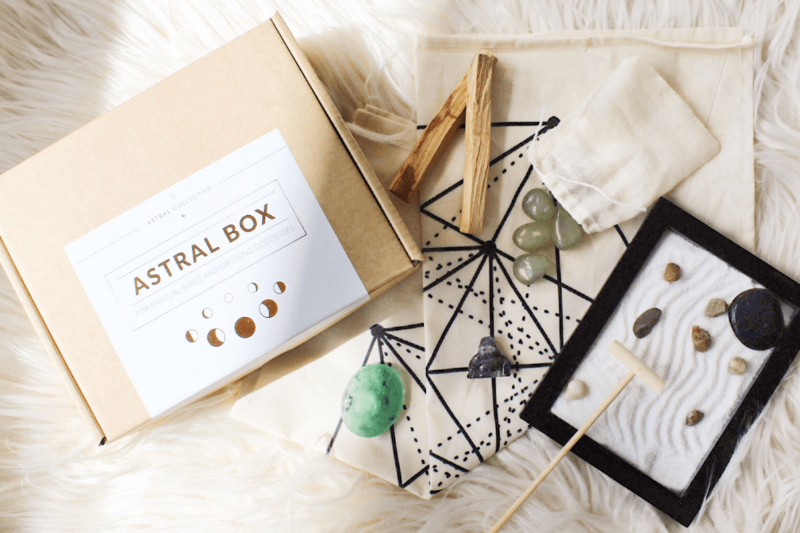 You will be receiving a set of Aventurine to use with your crystal grid, they can also be incorporated in your Zen Garden, or as a gemstone for any other use. If you have one of the Gemstone Drink Bottles from November you can add it to them! Green Aventurine is known as the stone of opportunity. Thought to be the luckiest of crystals, especially when manifesting prosperity. It can help spiritually with releasing old habits so new growth can take place. It brings optimism back into life. Fluorite is a highly protective and stabilizing stone, useful for grounding and harmonizing spiritual energy. When working with the upper chakras, Fluorite increases intuitive abilities. Palm stones, sometimes called worry stones, are one of the best stones to use during meditation. Each buddha statue represents something different depending on the pose, but is always a reminder of meditation. The Buddha in this box is laughing, he is known for bringing happiness and prosperity. He is the symbol for abundance, and brings good fortune to your home. Amethyst is a stone of spiritual protection and purification. Get your space ready for Meditation. An alternative to Sage, that in our opinion smells a lot better. Purify and cleanse your space with Palo Santo a.k.a. Holy Wood before or during meditation. This wood is sustainably sourced from naturally fallen trees in Ecuador.